This entry was posted on March 13, 2014 by Bill Xu. 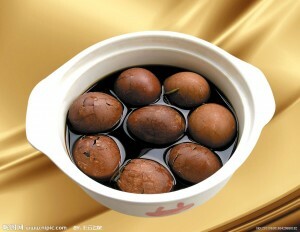 Tea egg is a typical Chinese savory food commonly sold as a snack, in which a pre-boiled egg is cracked and then boiled again in tea, sauce and/or spices. It is also known as marble egg because cracks in the egg shell create darkened lines with marble-like patterns. Commonly sold by street vendors or in night markets in most Chinese communities throughout the world, it is also commonly served in Asian restaurants. Although it originated from China and is traditionally associated with Chinese cuisine, other similar recipes and variations have been developed throughout Asia.